All of these creative ways to organize jewelry has led me to believe that I do not have nearly enough cute necklaces. Lauren has at least 20 hanging from this fabulous towel bar and shower curtain hook combination. 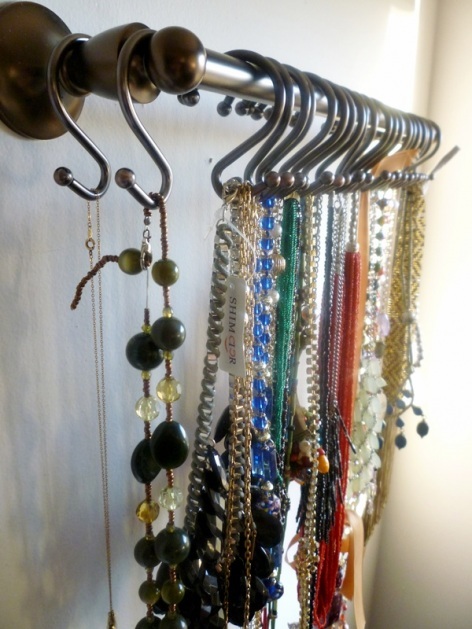 What a great way to keep your necklaces from getting tangled! I guess I will have to take a trip to Sam Moon and resolve this issue. You can check out Lauren's jewelry organizer (and her spaghetti squash and roasted pumpkin seed recipe while you are at it) over on A Full Measure of Happiness. And if you want to see a few more creative and slightly funky ways to organize jewelry, check out the cheese grater earring organizer, the oven rack jewelry organizer, and the vintage rake necklace display. I like this idea! I have a lovely jewelry box but way too many necklaces jammed in there! I love this! I've seen different ways to organize as well, but did not want to hang something else on the wall - a lot of what I have seen had that aspect. I can use the towel rack I already have on the wall! Thank you! I have never thought of getting a necklace hanger for my collection. Seems like this will be more practical than using a box.